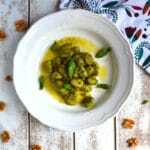 Gnocchi with walnut and chilli pesto, a simple and easy pesto tossed with gnocchi makes the ultimate speedy comfort food meal! Put a large pot of water under a medium-high heat and bring to the boil. Meanwhile put the basil, garlic, walnuts, parmesan and olive oil in a bowl and blitz with an immersion/hand blender to a smooth paste. You can of course use a mortar and pestle (does anyone else say pestle and mortar? I do) to do this instead of a blender. Once you have a smooth paste add the lemon, salt and pepper to taste. Mix in the chilli paste, you just want a subtle, little bit of heat, nothing too harsh. If the pesto seems too thick add a little more olive oil to your liking. Remember it’s a sauce so you want it to be able to coat the gnocchi nicely and not be too claggy. Season the boiling water with a good pinch of salt then add the gnocchi. When they start to come to the surface (only 2-3 minutes) they are ready. Drain them then add them back to the pot with the pesto and stir until completely coated. Serve in bowls and garnish with some left over basil and parmesan, enjoy!